This is my pick from the Sweet Tomatoes Salad Bar Restaurant. 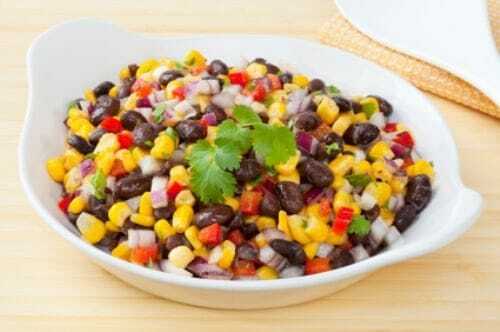 It is a great flavorful bean salad. You can make it with common, and it tastes completely different than ordinary bean salads. Our recipe will provide you with a light and healthy side dish option for your next meal. This is easy to make, and best of all its light and healthy. Rinse and drain red beans, black beans, and garbanzo beans. Add onions, cilantro, and jalapeno peppers. Add dressing and mix well.Mix well and pour over salad and blend well. Cover and set in refrigerator for a couple of hours to let the flavors blend. I loved Sweet Tomatoes’ Vegetarian Chili and would love to have the recipe. I have found none on the internet that sound as good as theirs was. We are heading to S.T. on Monday for the mushroom soup. I love their mushroom soup too! Loved this I did put the Jalapeno peppers on the side for the guys to add to theirs but other wise I left this just like the recipe and we all loved it.